Illyria is a series of eight designs, produced as limited editions, inspired by poetic and literary themes, commissioned by B&W Thornton of Stratford-upon-Avon. All the designs except 'Under The Greenwood Tree' which was solely designed by Timothy Harris, were a combined effort between Guy Thornton and Timothy Harris. There are three variants of the chalice — Oberon, Puck and Titania — produced as an edition of 10 pieces each. The top has a silver cameo frieze and the bottom is similar to Summer Fruits. Each vase is approximately 26 cm tall. Oberon was king of the fairies, Titania was queen of the fairies, and Puck was another character in the Shakespeare play A Midsummer Nights Dream. Moth is a cylinder vase, 22 cm tall, with a silver cameo design. It is limited to 25 pieces. Moth was a fairy in the Shakespeare play A Midsummer Nights Dream. 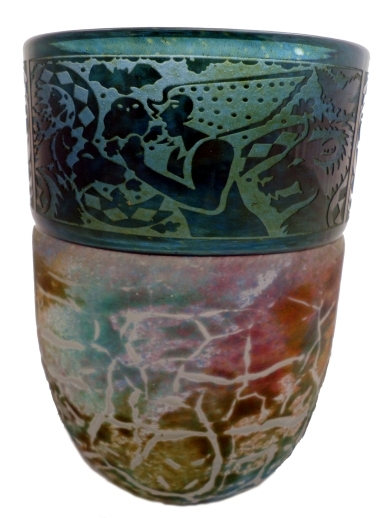 This design is a cylinder vase, 35 cm tall, in three variants — Leda Aeneas, Leda Swan and Leda Leda. The top half consists of a silver cameo design and the bottom half is similar to Nightscape. Each variant is limited to 20 pieces. This design is similar to Crizzle & Cameo with blue and white variants to the crizzle part. The vases are 9 cm tall. Each variant is a limited edition of 25 pieces. 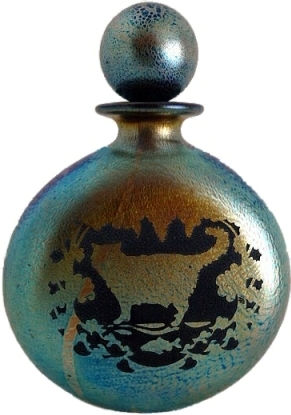 This design is a flask-shaped bottle with or without a stopper. Without the stopper it is about 12 cm tall. It has a silver cameo of the poet Keats on one side and a cat on the other side. It is a limited edition of 25 pieces. Images courtesy of Trudy Elkins. Cobweb is available in three variants — Head, Boar and Piglet. They consist of small vases 9 cm tall with a silver cameo frieze at the top and a pattern similar to Summer Fruits at the bottom. Each variant is a limited edition of 20. Cobweb was a fairy in the Shakespeare play A Midsummer Nights Dream. 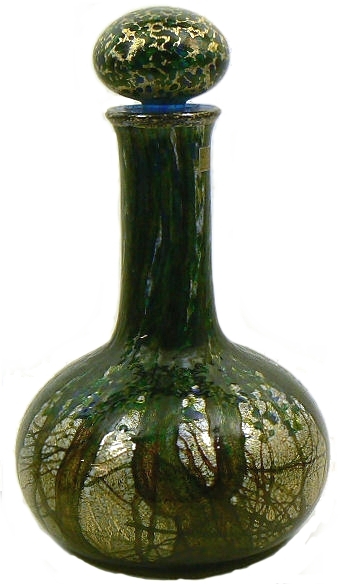 This design is very similar to Undercliff 'Day' and consists of a decanter with an onion-shape bulb, a long neck, and mushroom stopper. It is about 30 cm tall. An edition of 25 pieces was made in 1999. The name of the piece refers to the novel by Thomas Hardy. This design is available in two variants — Puck As Herne and Puck As Ostara. 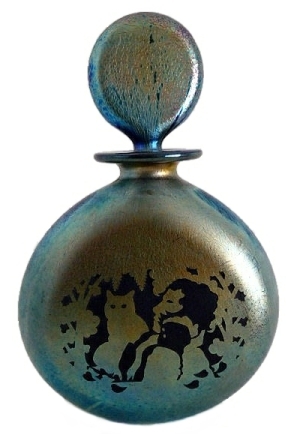 The vases are 9 cm tall and are similar to Crizzle & Cameo. Each variant is limited to 25 pieces.